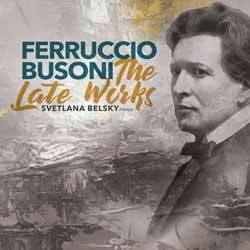 Ferruccio Busoni: The Late Works was compiled and performed by Svetlana Belsky, who first discovered her love for the composer during her doctoral studies. Here she avoids any attempt at stylistic classification, but rather interprets each and every piece with great respect to the particular work's inherent nature. Busoni's pieces run the gamut from a late-Romantic, occasionally even classical aesthetic to borderline atonality, and Belsky captures the soul of each piece, regardless of whether the composer furiously tears down form and tonality in 'Sonatina Seconda', whether he reminisces in Chopin's lyricism in his 'Nine Variations', or whether he allows himself a rather off-colour compositional remark by citing "Greensleeves" in 'Turandots Frauengemach'. This is an album you'll totally love, due to its wide range, or shy away from because you'll feel uncomfortably cold towards some of his more avant-garde compositions. Scholars of Busoni will relish the opportunity to own such a diverse collection.